There are some helpful things that all residents can do to help keep the villages as clean and attractive and as pleasant to live in as possible. All three villages (Solers, Oliffe and Hampen) are on the Gloucestershire Way walking route and attract visitors from around the world. From time to time the Parish Council is asked if there is any action that can be taken formally to complain about the behaviour of residents' neighbours. Mostly this relates to the noise coming from late night parties but it can also include smoke from chimneys, barbeques or bonfires, barking dogs, unpleasant smells e.g. septic tanks, builders or DIY noise etc. The police are reluctant to get involved in these matters and similarly the District Council have delegated responsibility for dealing with these situations to the local community. Often such problems are resolved amicably however if this is not possible we have been advised by Cotswold District Council that Section 82 of the Environmental Protection Act 1990 allows a Magistrate’s Court to act on a complaint made by any person on the grounds that they are aggrieved by statutory nuisance behaviour, and guidance on making such a complaint can be found here. It would be great if everyone avoided dropping litter and picked up and disposed of any small items of litter that they do see. Once a year the Women’s Institute run a village cleaning day. It is surprising how much they pick up and clear in a single day. But it shouldn’t be left to them to do it. 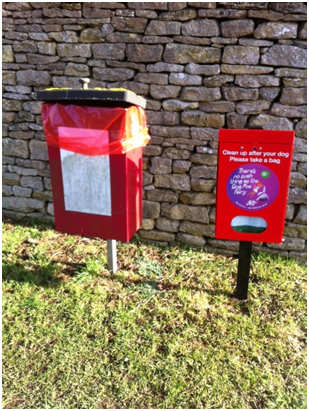 There are three dog poo bins (and bags) in prominent places in the village and the village is surrounded by open fields. So this should not be a problem but it is, with tedious regularity. Cotswold District Council is very helpful, and offers a link to report dog fouling http://www.cotswold.gov.uk/animal-control-welfare/dog-fouling/ The Council’s Environmental Wardens can issue a fixed penalty notice for £75 or refer the matter for prosecution in the courts where the fines could be £1000. The stream running through the village can sometimes carry garden equipment, toys, dead animals or just household rubbish downstream with it. Please don’t use the stream to dispose of non-degradable waste. The Environment Agency offer a link https://www.gov.uk/report-an-environmental-incident and 24 hour hotline (0800 80 70 60) to report significant stream incidents (dumping, pollution, blockages). However, if the stream does run by your house, it would be helpful (and will save money) to remove and dispose of small items of rubbish yourself. The Environment Agency also publish Living on the Edge a guide for those with water running through their land describing their riparian rights and responsibilities.